On Saturday morning, October 6th, 2007, Venus, Regulus and Saturn will form a wide triangle with the Moon hovering high above them. The brilliant planet Venus arrives at the pinnacle of itscurrent morning apparition next week, rising at, or shortly before 3:20 a.m.local daylight time, its earliest rising time this year or next. That works outto more than two hours before the first sign of dawn begins to light up theeastern sky. At sunrise, Venuswill have climbed nearly 40 degrees above the east-southeast horizon (10 degreesis roughly equal to your clenched fist held at arm's length. So at sunup, Venuswill stand nearly "four fists" up from the horizon). Meanwhile, a much dimmer planet, Saturn, glowing with amellow yellow light, rises shortly after Venus. And right in between the twoplanets shines the blue-white 1st-magnitude star, Regulus, in Leo, the Lion. Next week, an ever-changing "Celestial SummitMeeting" will greet early risers as Venus interacts with Regulus, Saturnand a lovely crescent Moon in some very interesting celestial configurations. The eye-catching array kicks off this weekend. On Saturdaymorning, Oct. 6, Venus, Regulus and Saturn will form a wide triangle with theMoon hovering high above them. 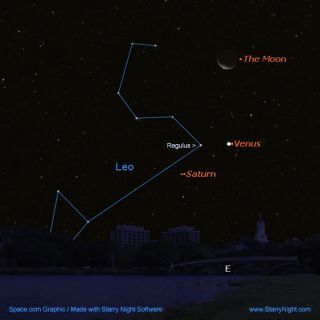 On Sunday morning, Oct. 7, the Moon will be strikinglypositioned inside of the Venus-Saturn-Regulus triangle. Venus will appear to speed to the south of Regulus onMonday, Oct. 9. Then finally, on Sunday, Oct. 14, Venus will pass to the southof Saturn. In telescopes and even steadily-held binoculars,Venus is revealed this week as a wide crescent, but as it pulls ahead of Earthand speeds away in its orbit, its disk will shrink and it will display an apparenthalf-moon phase as seen in a telescope, soon after the start of November. Saturn, in contrast appears much dimmer – about 1/120 asbright as Venus – primarily because it's located about 17 times farther out inspace than Venus as seen from here on Earth. Another factor is that the famous ring system, which can beseen in any telescope magnifying over 30-power, is gradually closing as seenfrom our Earthly perspective. Their angle of inclination diminishes from 8.8 to7.4-degrees during October. By the summer of 2009, the rings will appearedge-on to us and will be difficult, if not impossible to see, even in largetelescopes. As for Regulus, it marks the heart of Leo, a star patternwhose origins trace back to the earliest Mideastern peoples, especially thoseof the Tigris and Euphrates area. Among virtually all civilizations there, thisconstellation was accorded king-of-the-beasts status and regal symbolism. And although it shines only 1/229th as bright as Venus andranks at the bottom on the list of the 21 brighteststars, we know today that Regulus is also regal in an astrophysical sense. It'sa highly luminous blue-white star, and just as earthly kings were uncommonpersonages among the human population, a star like Regulus is also uncommonamong the stellar population. Its spectral class is B7; one of the very smallminority of those born with enough mass to occupy an exalted station near thetop of the main sequence of star classification. And lastly, its distance of 78 light-years means the lightyou see arriving from Regulus now started on its journey to Earth right aroundthe time of the great stock market crash in 1929.